Dr Seuss drawings are so quirky that I decided to go with “imperfect” quilting. I market the outside of each circle with a small plate but the inside quilting ( the concentric rings) was just quilted free hand) the result is that no 2 are the same and I think that works with the fabric. The circles are a nice contrast with the square blocks. The quilting went fast because I did utility/big stitch quilting at about 6 stitches per inch. Once again the fabric told me how to quilt. These quirky whimsical figures didn’t seem to call for meticulous tiny stitches….I think relaxed and casual is a better fit. 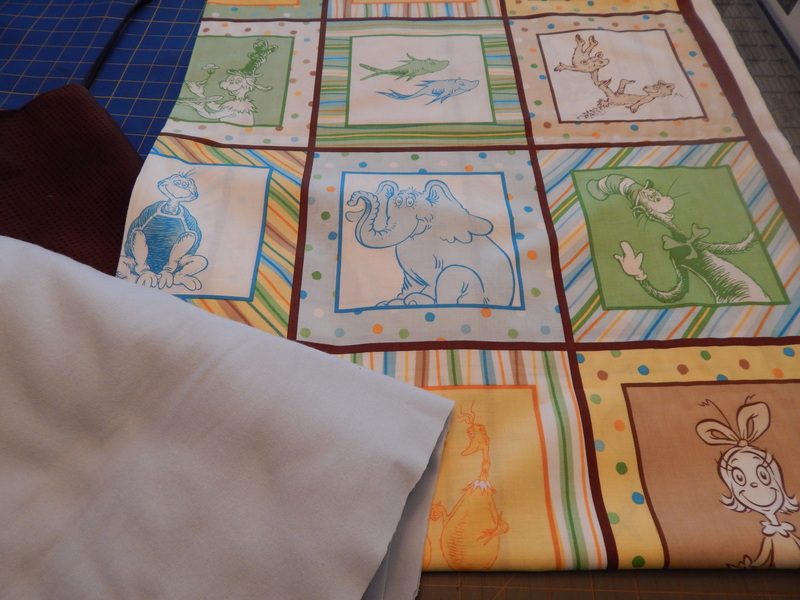 I might need to start making more baby quilts….they go so fast that it sure makes you feel productive! Now back to one of the many UFO’s in the pile! 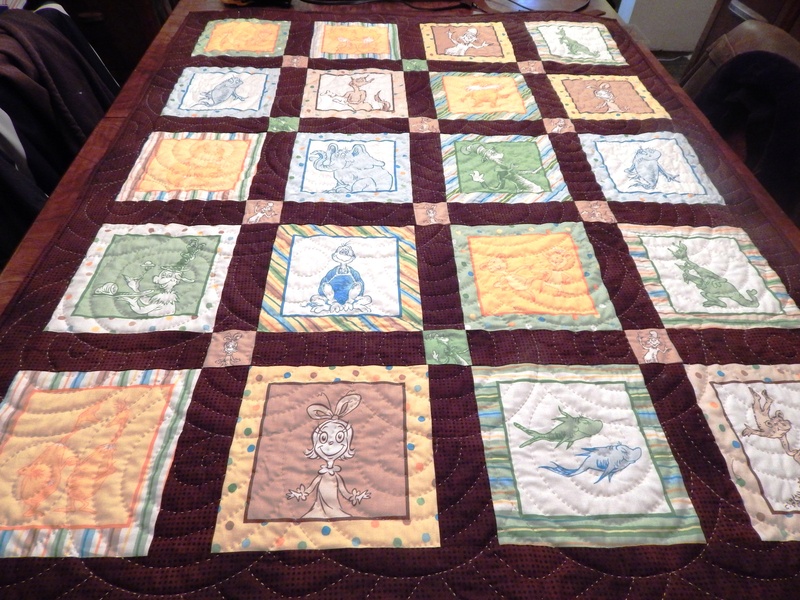 This entry was posted in Quilts and tagged baby quilt, Dr Seuss Quilt, hand quilting, Quilting, Quilts. This looks great! 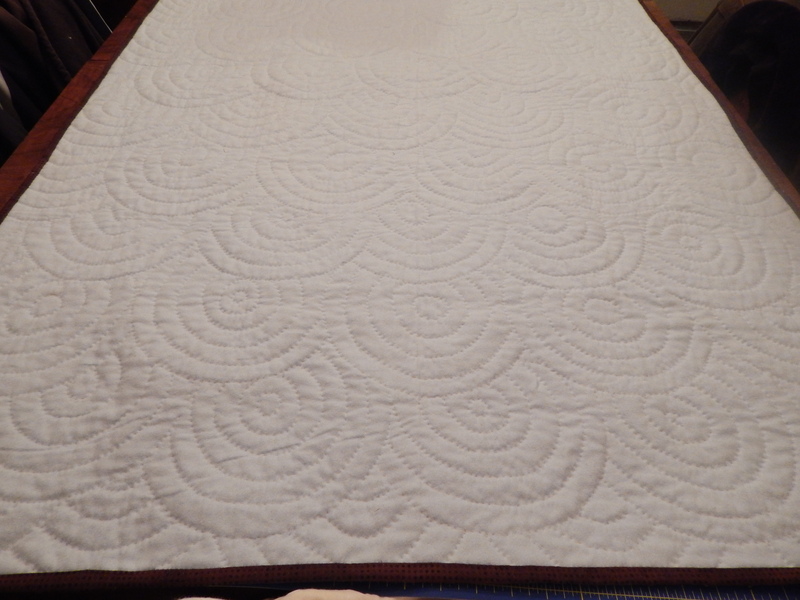 Your blog helped inspire my new year’s resolution to try hand quilting! great! I hope you enjoy had quilting as much as I do!! Very nice! That was fast. I love Dr. Seuss so I have been following these posts more closely. Love how it turned out 🙂 I’m curious as to what implement you use to mark the circles (pen etc.) I remember that you used a plate for a template. Good to know! I guess both pencils wash out easily? I am worried about regular lead that you used on the light sections. I’m thinking of doing my first hand quilted project so this is super helpful. I generally machine quilt (freehand) and don’t mark anything. I have one of those blue markers that supposedly washes out, but I have heard horror stories of it not washing out sometimes! 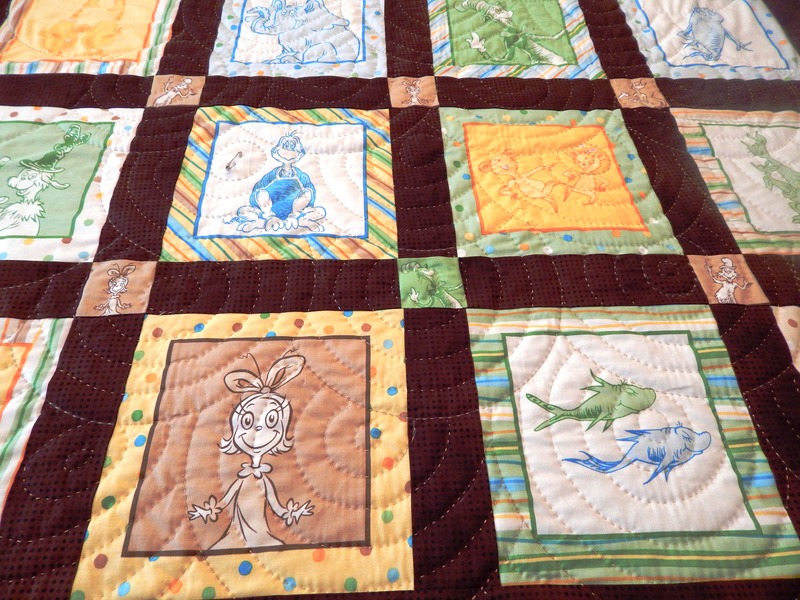 Very nice baby quilt, sure gives one ideas for charity quilts for children. Thank you for sharing your gift of quilting with us Tim. I really enjoy every one. . .
That big stitching goes so fast! 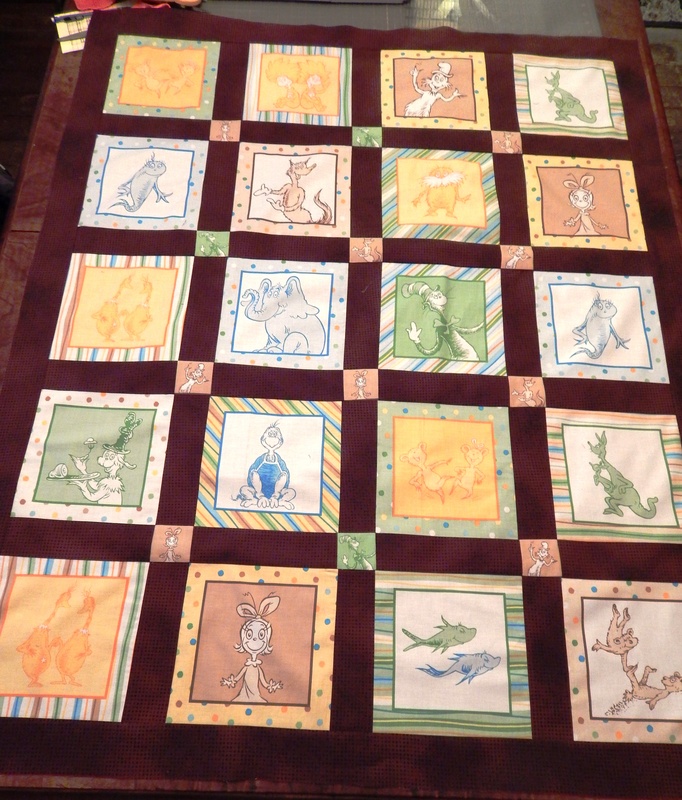 Great job on the baby quilt. This one is whimsical enough to be a favorite for a long time! So fun and well thought out! That’s one lucky baby, and with the weather you’re getting, I’m guessing the extra warmth will be appreciated too! I want to make one! I always felt that using printed panels would look cheap and part me always felt it was cheating. I am now convinced that i was wrong. Simple and spectacular. Bravo! What a super fast quilt. It looks great and I love how you went free hand inside the circles, a perfect fit for the quilt. Bravo and Congratulations….it’s a lovely gift!!! Tim I hear you with frozen pipes – we had a cracked line in the front yard yesterday that Mike was out in 27 degree weather fixing all afternoon! hope it warms up soon for all of us! 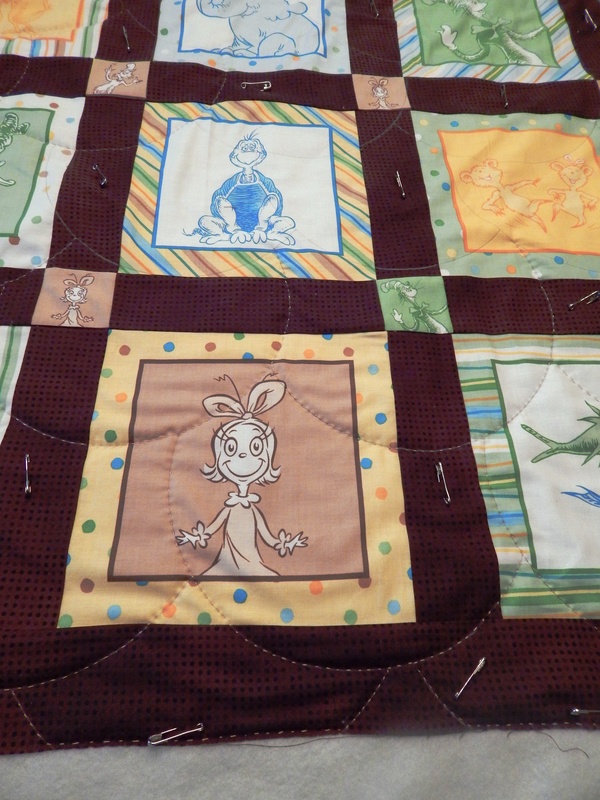 You mentioned you were quilting about 6 stitches per inch on the Dr Seuss quilt. How many stitches do you use on your other pieces, like the Tree of Life? Thank you for sharing all of your pieces! When you start marking a quilt with the circles, where do you start the first circle? In the center or on an edge or ? I always seem to quilt myself into a corner where the last circle or circles don’t seem to fit with the others.